Innovation in Materials Research Award | Rustum and Della Roy Innovation in Materials ResearchPurposeThe Rustum and Della Roy Innovation in Materials Research Award is designed to honor interdisciplinary materials research at Penn State which yields innovative and unexpected results. 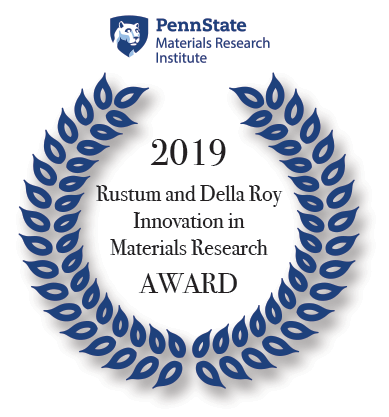 The Rustum and Della Roy Innovation in Materials Research Award is designed to honor interdisciplinary materials research at Penn State which yields innovative and unexpected results. Three awards are granted annually—two graduate student awards and one postdoctoral or junior faculty award. The award value is $750 (minimum) for graduate student recipients and $1,500 (minimum) for the postdoctoral researcher or junior faculty recipient. Full-time graduate students, postdoctoral researchers, and junior faculty members currently conducting interdisciplinary materials research at Penn State are eligible to apply. Senior research associates and associate professors are ineligible. Recipients of this award are not eligible to reapply for subsequent consideration. A call for applications is disseminated annually by the Award Panel appointed by the Materials Research Institute. Each graduate program can put forward a maximum number of two graduate student nominees and one postdoctoral researcher or junior faculty member. Please email an electronic copy of all required materials in a single PDF file, collated in the order below, to the Awards Panel at roy-award@psu.edu. a list of dissertation committee members. For the current 2018-2019 year, applications must be submitted through the online application to the Award Panel by June 30, 2019. A selection panel comprised of four Penn State faculty administrators familiar with interdisciplinary materials research will review the applications. Awards are disbursed through students’ Bursar Accounts in accordance with federal financial aid regulations.